President Donald Trump is considering naming Herman Cain, a former pizza company executive and 2012 Republican presidential candidate, to the Federal Reserve Board, according to two sources familiar with the matter. The possible nomination comes as Trump's most recent Federal Reserve pick, Stephen Moore, has come under fire for reports about his back taxes and failing to make alimony payments to his ex-wife. Trump has repeatedly criticizedthe Fed for its monetary policies and its stewardship of the economy under Chairman Jerome Powell, who was confirmed in January 2018. 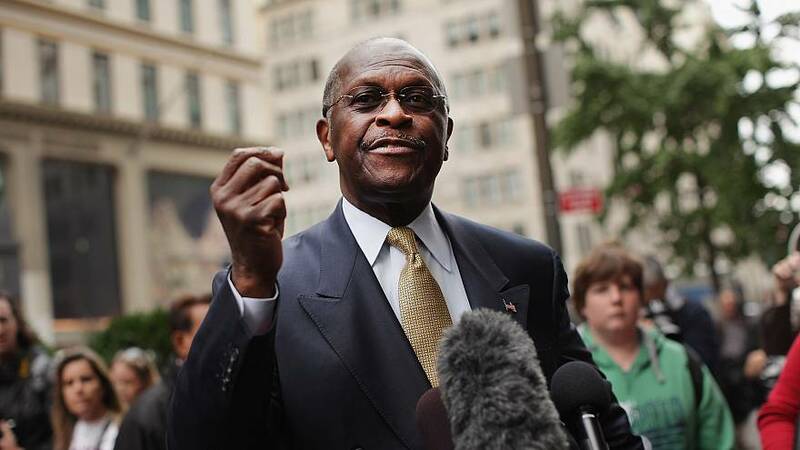 Cain's possible nomination was first reported by Bloomberg in January and again by Axios on Thursday. Cain ran the Nebraska-based Godfather's Pizza franchise from 1986 to 1996 and has claimed his leadership saved the company from bankruptcy. He frequently touted his business acumen in his run for president and was briefly a frontrunner and tea party favorite among a crowded field of GOP hopefuls. The businessman ended his presidential campaign, however, after allegations surfaced that he had sexually harassed several womenaround the time he headed the National Restaurant Association, which he ran from 1996 to 1999, and that he had an extramarital affair. Four women alleged inappropriate sexual behavior during their time at the association, two of whom were reportedly paid a settlement by the trade group. One of the womenaccused Cainof groping her and attempting to force her head toward his lap. Another woman alleged Cain had a 13-year extramarital affair with her that ended just before he started to run for president. Cain vehemently deniedthe allegations at the time. Trump at the time, publicly defended Cain, calling the accusations an"unfair witch hunt." Cain joined the Federal Reserve Bank of Kansas City in 1989, later becoming its deputy chairman and then chairman. During a GOP presidential debate in 2011, Caincriticized the direction of the Federal Reserve, arguing that it should be more accountable to the public. "Yes, it should be audited," he said. "And, secondly, I believe that its focus needs to be narrowed. I don't believe in ending the Fed, I believe in fixing the Fed."